Click here if you have received an invitation to use Fight Against Hate. When you are logged into your Fight Against Hate account, you may have the option to invite other users to register. If you have invitations available to use, the number will be visible on the Invite a user button, underneath the View Team Members button on your home screen. Click Invite a user to access an invitation form. If you have no remaining invitations available, the Invite a user button will not be displayed. 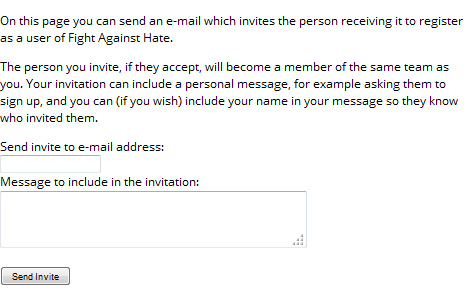 If you invite someone to use Fight Against Hate and they register using your invitation, they will be added as a member of your team. Input the email address of the person you wish to invite. You can input an additional message which will be sent with the invitation. Invitation issued to <email address invitation was sent to>. © 2011-2015 Online Hate Prevention Institute. See Terms of Service.